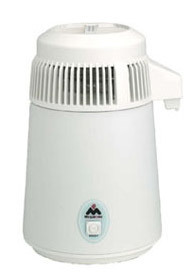 The Counter Top Water Distiller produces pure distilled clean water. It is easy to operate, easy to clean, a space saver, and mobile. There is no need for water purifiers or cartridges, which reduces pollution. After distillation, the water is transferred through an activated carbon filter, which will remove any unusual odors into the collection bottle. It automatically shuts off when the process is finished. The average period of use for each filter bag is 1 month.May vary based on water conditions. More economical by far. Comparable units can cost TWICE as much and aren't as good. Can make up to 4 gallons per day. Push a single button to start. Thermostatically controlled to automatically switch off. - At fewer than 8 Lbs you can easily take it with you on vacations or travels! Easy to clean. No need to purchase and replace dirty filter cartridges. Stainless Steel exterior Décor model matches other stainless steel appliances. Easy Cleaner in case it's needed for hard water scale buildup in your unit or for any other water scale problems you may have in your house, and a 6 month supply of Activated Charcoal Sachets to use if you have unusually odorous or extremely bad tasting water to begin with. They also remove residual VOC gases. 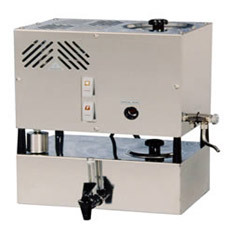 Designed with the largest lid opening in the industry and a v-bottom boiler for easy cleaning, your distiller is easier to maintain than others on the market. 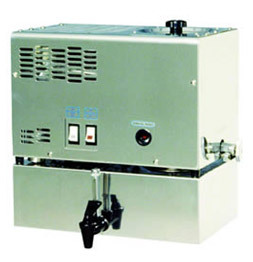 This distiller features high-quality power and fan switches, as well as a reliable float switch that shuts off the distiller when the water level is low, protecting the heating element from burning out. 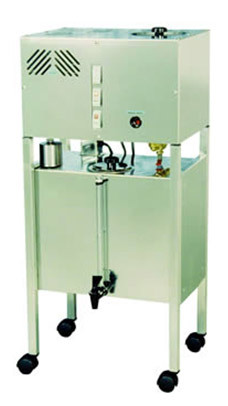 The Precision PWS 5-3 water distiller is a result of over 25 years of distillation manufacturing experience. 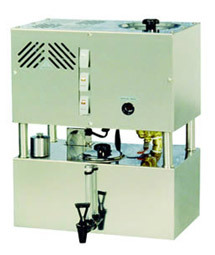 It's features and benefits provide the very best water system for steam distilled drinking water requirements. It provides safe, pure water at home for a fraction of the cost of bottled water. The PWS 5-3 duplicates nature's own method of purifying water. 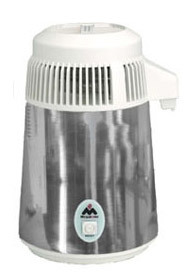 This highly reliable process for purifying water combines distillation with a high capacity activated carbon filter providing clean, great tasting water.